Shilpa Shetty's son Viaan dancing to Tiger Shroff's Baaghi 2 track Mundiyan Tu Bach Ke Rahi is probably the cutest video you'll watch today. 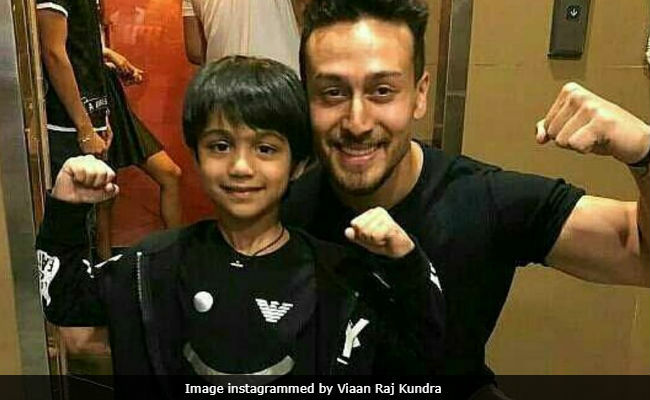 Baaghi 2 has gripped the box office firmly (with Rs 95 crore in its pocket) and five-year-old Viaan is proof of the film's popularity among audience of all age groups. He jumped up and down on the bed as he tried to copy Tiger Shroff's steps, choreographed by Ahmed Khan, who is also the film's director. "My super dancer, Viaan Raj Kundra, trying to copy Tiger Shroff (his superhero). Ahmed Khan, you made me dance to your tunes and now my son." Ahmed Khan has choreographed Shilpa's iconic song Main Aai Hoon UP Bihar Lootne among others. Shilpa Shetty married businessman Raj Kundra in 2009 and they welcomed their son Viaan in 2012. Shilpa Shetty last film was 2007's Apne though she appeared in Shut Up & Bounce (from Dostana) and later in a song in 2014's Dishkiyaoon, for which she was also a producer. Shilpa Shetty has published several books on fitness and has many DVDs on her Yoga routine. Shilpa Shetty is one of the three judges of dance reality show Super Dancer 2. Her co-judes are filmmaker Anurag Basu and choreographer Geeta Kapur.